According to ComScore Mobile Metrix, the average 18-24 year old spends 93.5 hours per month using smartphone apps. That’s 28 forty-hour work weeks per year. Time spent on desktop and traditional media is holding steady or going down while time on mobile continues to increase. By 2018, AdAge predicts the share of internet advertising going to mobile platforms will be 53%. As of 2016, mobile represents 42% of all internet ad spend. How do these data impact your practice? On the surface, every digital media agency, including your 12 year old, can give you the same advice: get on the digital and mobile bandwagon. Yet, if you look at the data more closely, decision makers still spend over 4 hours per day watching television and near 1.5 hours per day listening to radio. The radio number hasn’t changed in years because so many people listen at work and the television number has only ticked down by a minute per day in the last year. So, while all of your peers and competitors rush to digital, they are clearing a vacuum for you to show up in a category of one in traditional media like print, broadcast television, radio and direct mail. Sure, you need to have a digital platform with Google, YouTube, Facebook and retargeting ads that are mobile friendly, including in-app native ads. But the data don’t lie. As fewer serious marketers are willing to spend what it takes to get direct mail and other broadcast media to work, you can show up with less and less clutter in those media channels. We’ve been doing this successfully for years in addition to running highly successful digital media campaigns for mobile phone users. Anytime you look at the data, look at it with a blind eye towards bias. Ask yourself what the data are telling you and make decisions without the emotion of “what’s new” or “cool” right now. 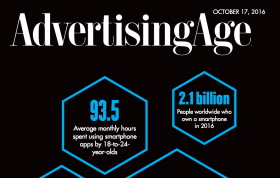 Even if mobile ad spend doubles to $40 billion, it still lives in the shadow of the $180 billion we spend in traditional media. Spend a lifetime trying to get a video to go viral or to become the next YouTube or Instagram star and you might become famous. Odds are not in your favor. But, spend a consistent, pre-set amount on cable TV, terrestrial radio and broadcast TV and I can guarantee you will be a local celebrity in your market. When everyone else runs towards a new media and jumps in with both feet, the smartest business owners and investors have it on their radar but they move in and gobble up market share on traditional media while everyone else is distracted with the latest whiz-bang social media site. Do you remember MySpace? Don’t forget it.